Drying mats placed on hardwood boards in a South Miami kitchen can prevent the need to replace this costly flooring. 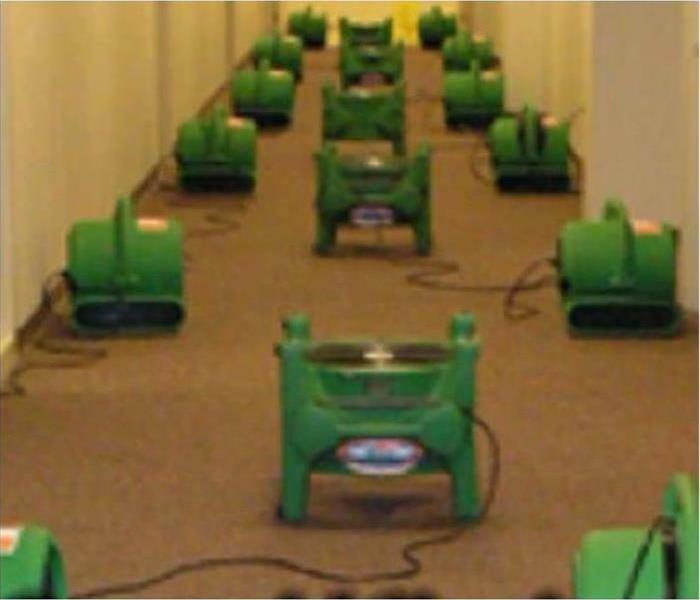 SERVPRO used advanced equipment deployed by highly trained crews to mitigate water damage for our clients. We both love to save them money. The roof is torn open by tropical force winds; the wise move is to call SERVPRO immediately to protect your Kendall property. 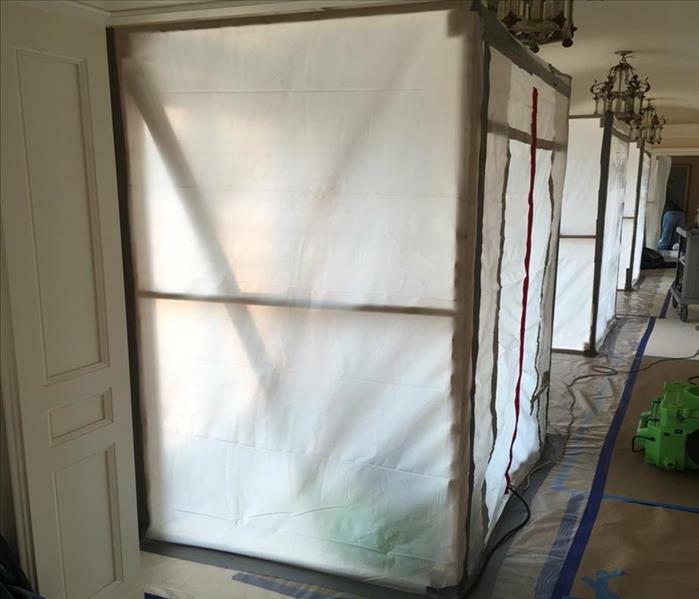 Our team can place tarps and board-up the damaged areas as another team member begins the removal of the unwanted, contaminated insulation and hanging debris. Fast response, fast service, fast restoration. So Why not SERVPRO? 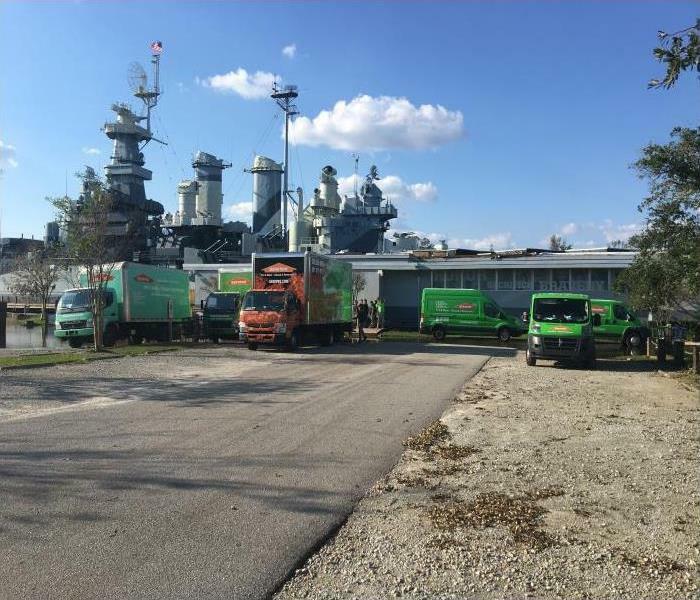 SERVPRO of South Miami rented a boat to get help and equipment to the Battleship “welcome center.” This 13,000 sq Ft building was totally flooded from Hurricane Florence destroying the roof. SERVPRO can handle either a small or large scale response to a disaster in your area. Our team can handle any size disaster. We can respond 24/7 to your fire damage emergency. SERVPRO of South Miami has the equipment, training, and experience to restore your home to pre-damage condition. We take commercial flood damage very seriously. 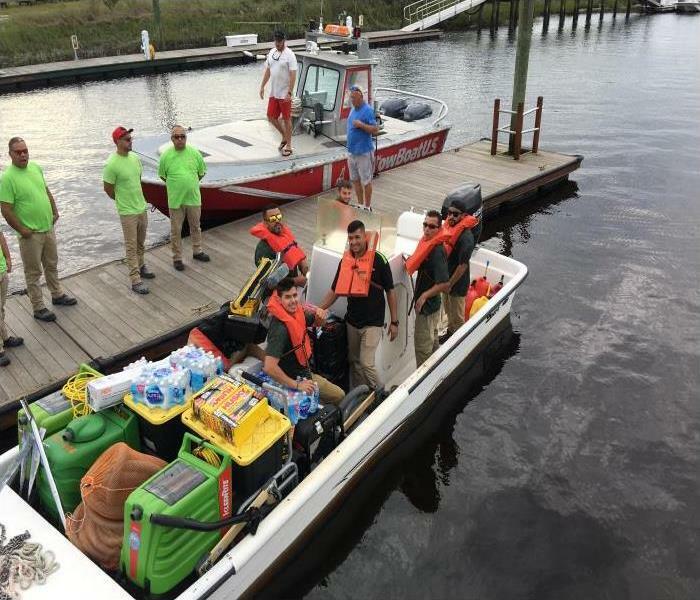 When the welcome center at the Battleship North Carolina Memorial experienced flooding from Hurricane Florence, we knew we needed to help. We will use advanced equipment and specialized cleaning techniques to restore this property to pre-damage condition. Our experts are highly trained and can handle any size disaster. 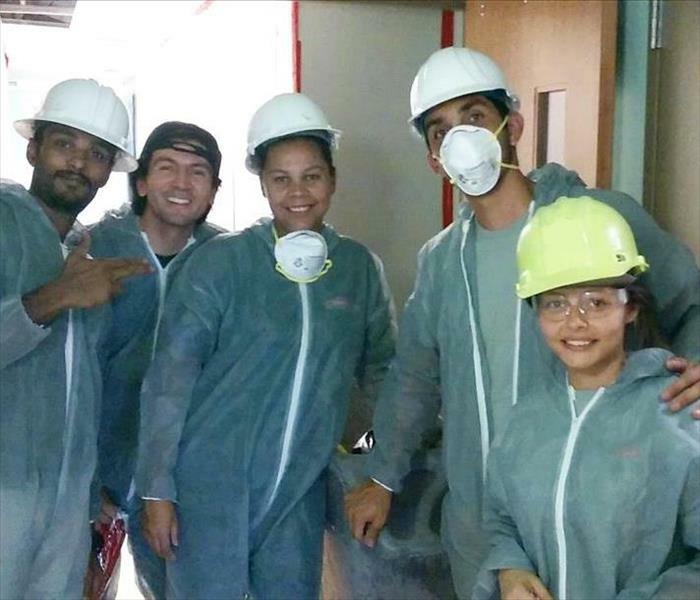 Our team at SERVPRO of South Miami will go the extra mile to help our customers. Our crew rented a boat and headed out to the Battleship North Carolina welcome center. This 13,000 sq. ft. building was flooded because Hurricane Florence damaged the roof allowing water in. Our team is ready to assist anyone in need! We’re Here to Help! Do not let a mold infestation take over your home! Our experts have the experience, training, and specialized mold remediation equipment to restore your home to pre-damage condition. 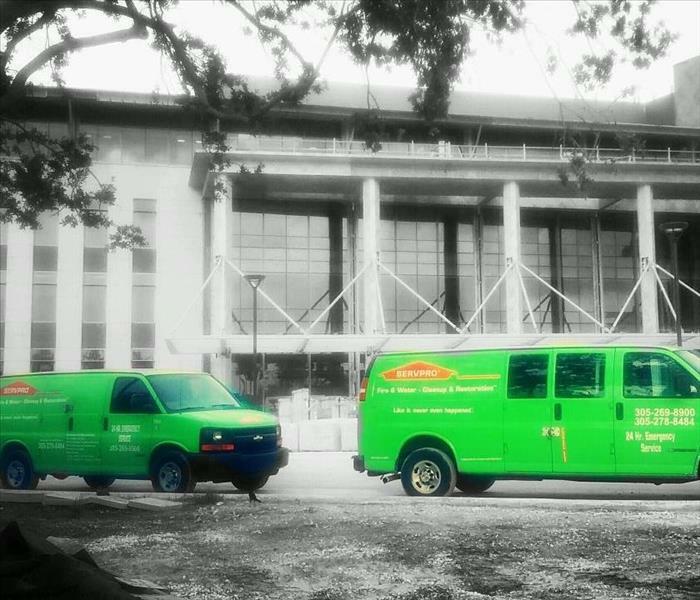 SERVPRO of South Miami is ready 24/7, locally owned and operated, and Faster to Any Size Disaster! As we approach hurricane season, you need to get your commercial property ready. Since we provide 24-hour emergency service, we can respond quickly to any disaster. Our storm damage specialists have the experience and equipment to handle any hurricane damage. When hurricane season arrives, you can depend on our team at SERVPRO of South Miami to be ready and available. The professionals at SERVPRO are your best choice when dealing with fire damage repair and restoration. 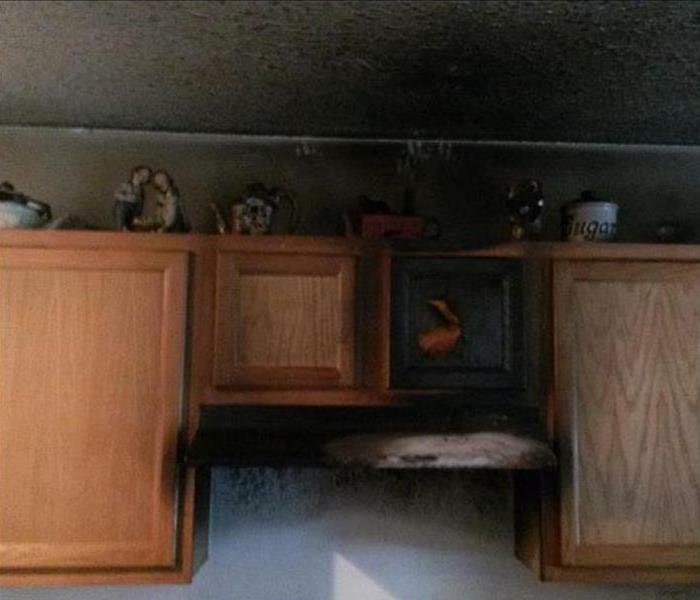 Fast action is required when dealing with fire damage, and our team is available 24/7. SERVPRO of South Miami is a leader in the restoration industry, and our fire restoration technicians are certified by the IICRC in fire restoration. We have the equipment, training, and experience needed to restore your home to pre-damage condition. We’re Faster to Any Size Disaster! 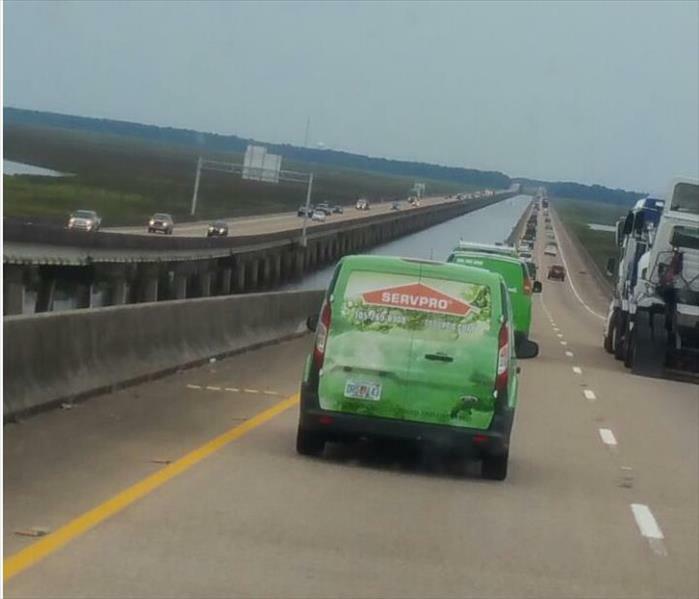 SERVPRO of South Miami hit the road and cruised the causeway to help with the Hurricane Irma cleanup in the Florida Keys. A part of our SERVPRO Disaster Recovery Team spent three months helping our neighbors get their lives back to normal. We kept our spirits high while lifting those of the less fortunate, through this challenging time. We are proud to be of service. Our SERVPRO of South Miami team responded to a call to clean a yacht after a fire at the Yacht Club of Delray Beach. Cleaning and restoring boats require a unique blend of training and experience. Our team handles commercial fire restoration for homes, businesses and yachts. If you suffer fire damage in a small office building or large residential condominium, we can help you recover and get back to business. Our great reputation for quality work and outstanding customer service has been built satisfying customers in Miami, Coconut Grove and Coral Gables. The view may take your breath away. But so can the musty odor from a mold infestation. 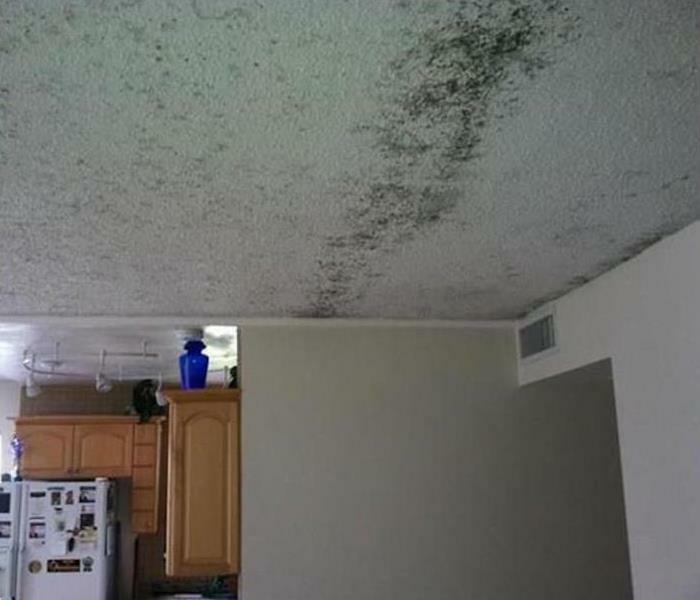 SERVPRO of South Miami recommends that you have your dream condo inspected for a mold infestation before you purchase. Our AMRT applied microbial remediation technicians have prepped this unit with an oceanic view for a mold removal and cleanup service. We can make it "Like it never even happened." 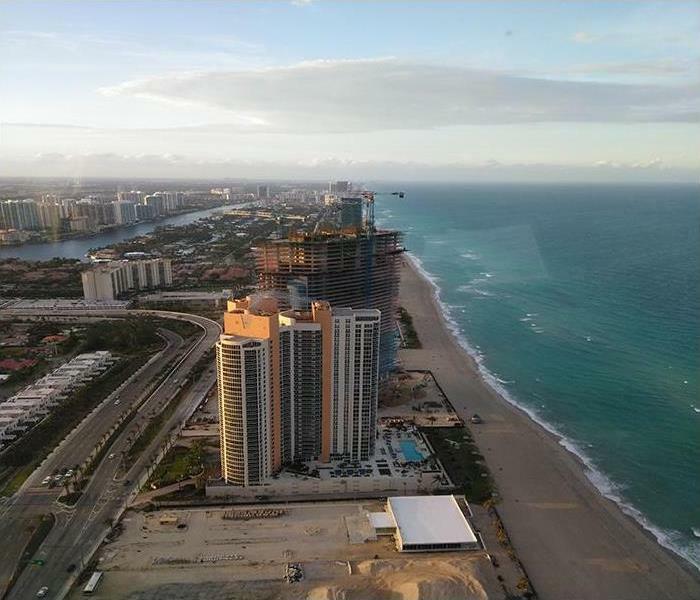 Storm damage in South Miami can reach epic proportions requiring large sized commercial equipment to provide appropriate remediation for the circumstances. SERVPRO of South Miami is prepared to provide the latest technology available and provide the right size equipment for any disaster. 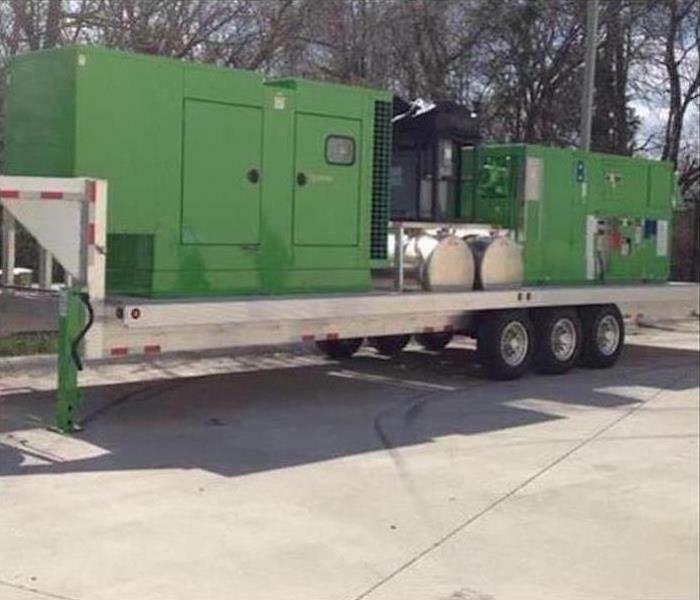 This photo shows a trailer mounted desiccant dehumidifier. The beginnings of a mold infestation are shown by the dark stains on the floor joists and sheathing in this Coral Gables property. The homeowner called SERVPRO immediately to remediate the problem and mitigate losses. We planned to apply an antifungal agent to exterminate the fungi and suggest an encapsulation service to protect his entire property from excess moisture. 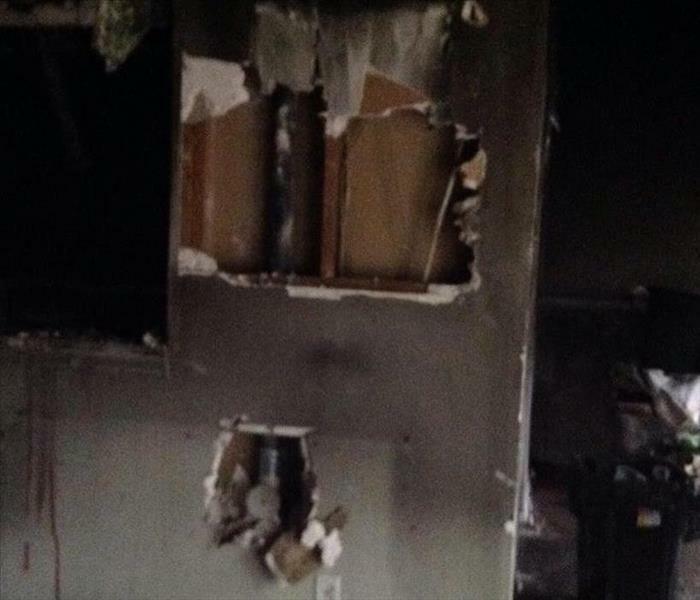 The sooty residue is what remains after the walls were wiped down after this small fire in a South Miami bathroom. The door was kept closed during the cleanup to prevent the migration of grime and smoke particles. SERVPRO techs did a quick, thorough job much to the delight of our customer. The dampness from this office in the Century Village office was damp from the water. We placed a dehumidifier and an air mover to increase the rate of evaporation. The vinyl floor coving was removed to make sure we thoroughly dried the lower drywall that was wetted. We strive to restore before we replace. Storm damage occurred when high winds blew a tree limb through a window allowing the rainwater to enter freely into the interior of this Miami home. The carpeting and padding were destroyed, and the subfloor was saturated with water. We pulled ou the carpet and padding and discarded it properly. 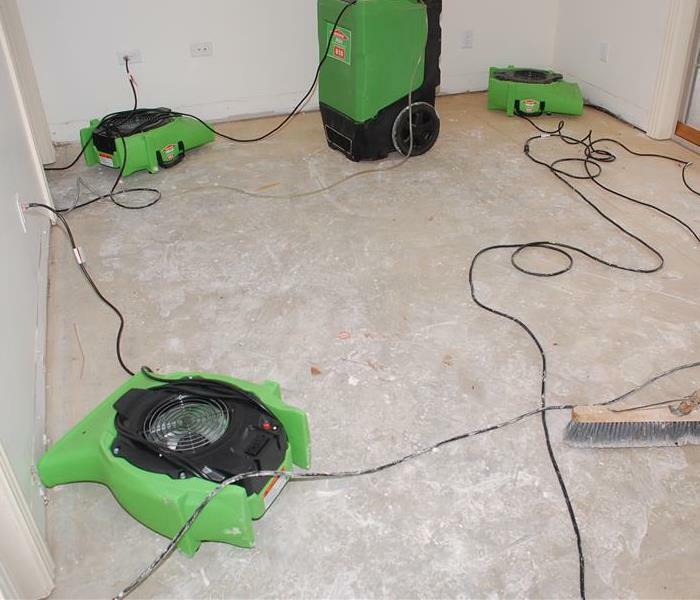 WE suctioned the subfloor and set up commercial air movers and dehumidifiers to help with the drying process. 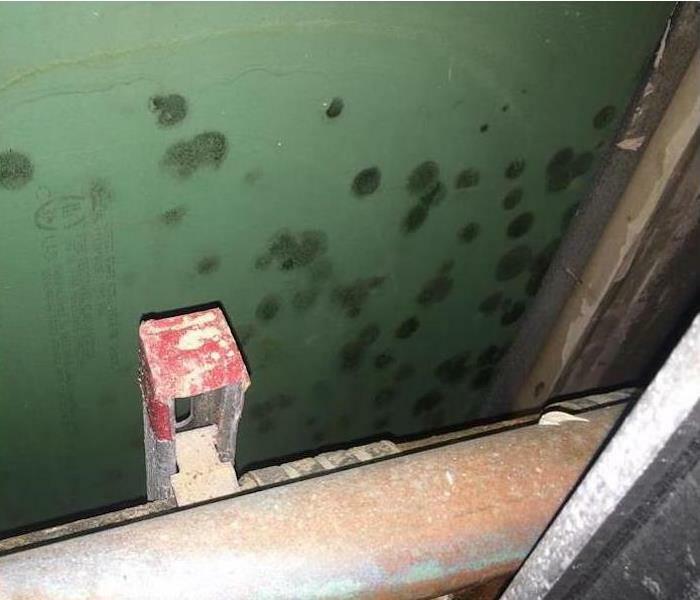 Mold damage in South Miami can develop very rapidly when water damage and darkness are coupled as was the case in this photo. SERVPRO of South Miami has the products and procedures to clean up mold and return all affected surfaces to preloss condition. 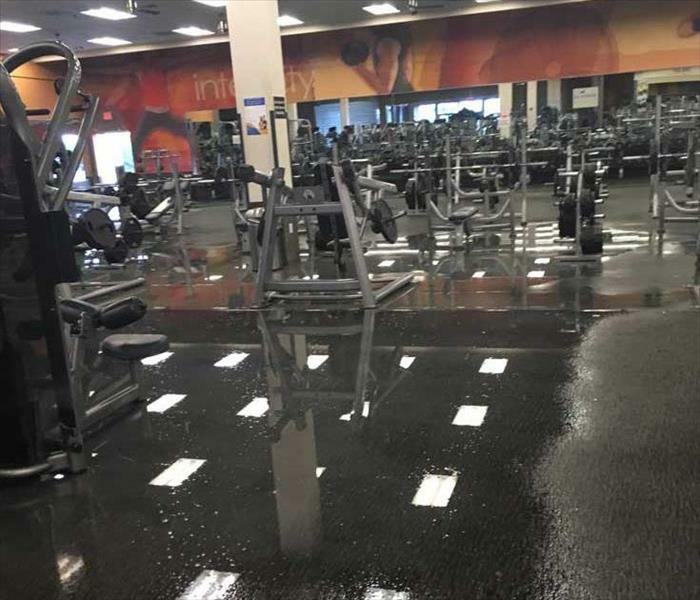 The pooling water on the synthetic flooring required rapid removal to mitigate water damage caused by this storm. Our SERVPRO team worked into the night to save the floor equipment from becoming rusted and non-functional. The establishment was closed for several days due to the extent of the water damage. 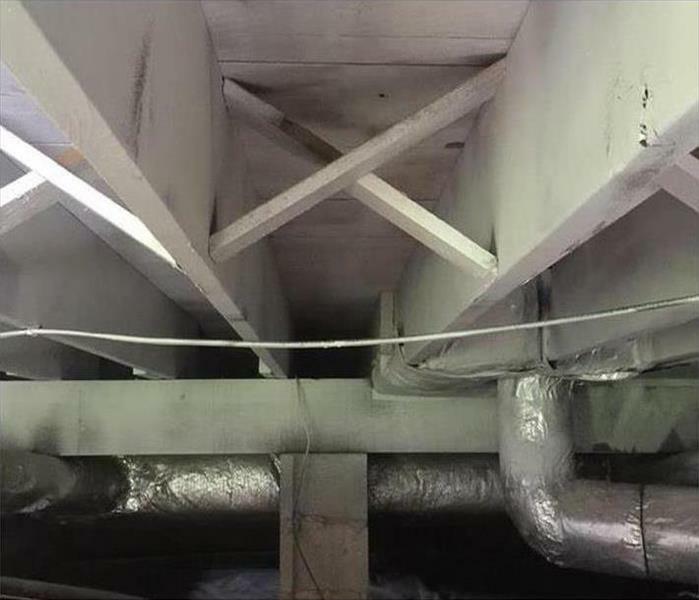 Our team set up many low grain and conventional dehumidifiers to extract the remaining moisture that was trapped within the walls of the LA Fitness Center in Hialeah. The tubes suction the water molecules from within the voids of the walls to ensure a return to normal RH levels. 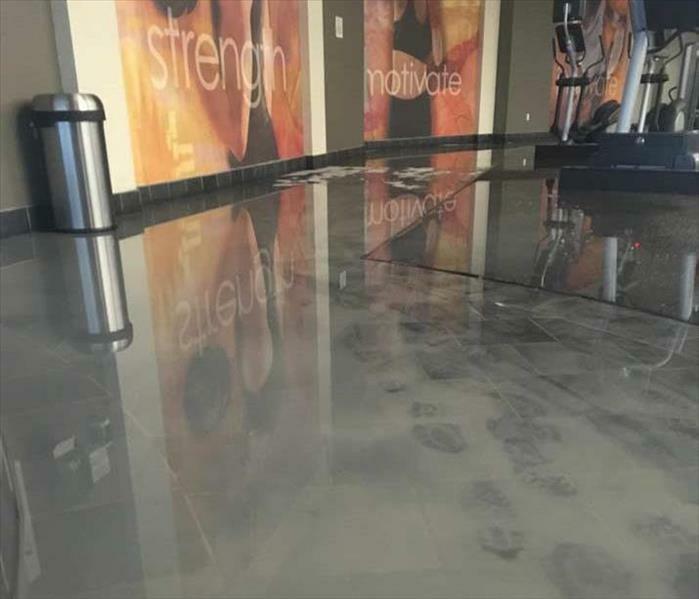 This photo depicts the huge amount of standing water on the floor of the fitness center. 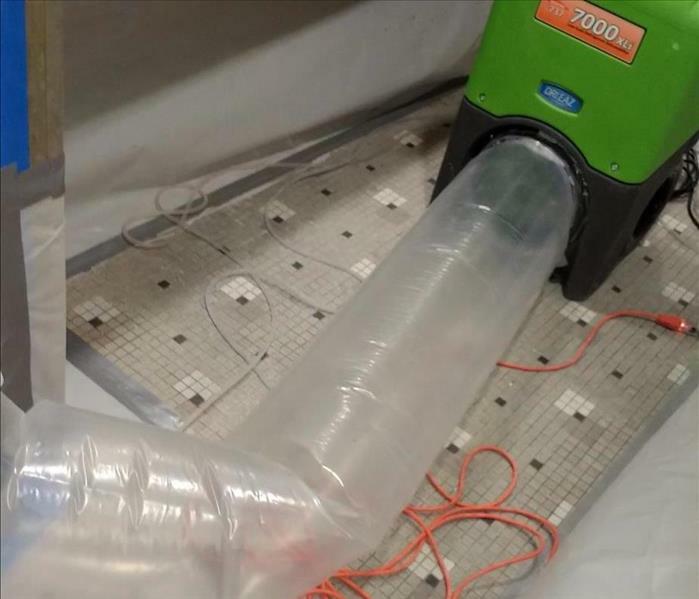 We were about to deploy a large number of wet-vacs to remove the visible water and then air movers and dehumidifiers to start the dehumidification process. Count on us to do it right! 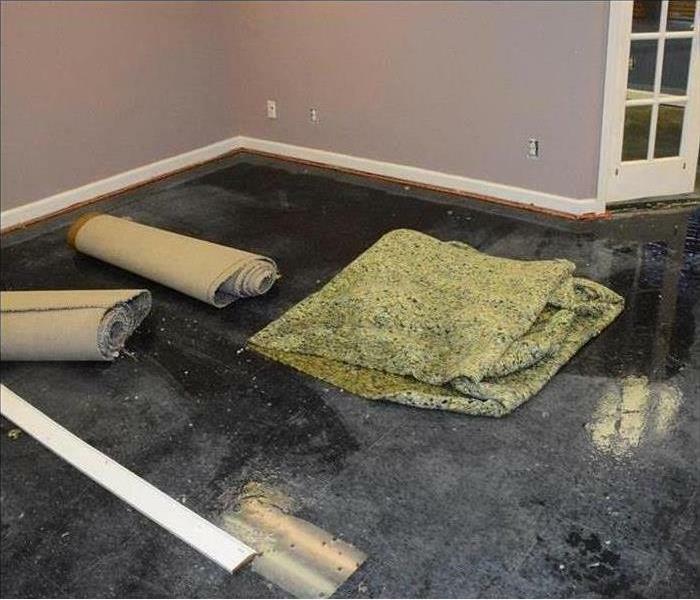 SERVPRO Takes the Guesswork Out of "Dry"
During the water removal and drying services our IICRC and corporate trained team follow rigid protocol to ensure that the water damaged establishment is restored to its preloss condition, "Like it never even happened." 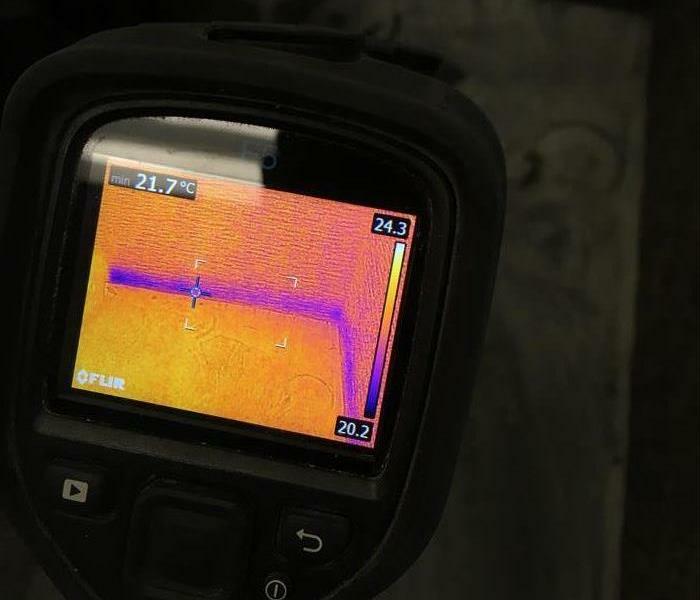 Here is an infrared camera indicating the lingering pockets of moisture that we will eliminate. The large volume of water was extracted using portable wet-vacs and even one sump pump for quick results. 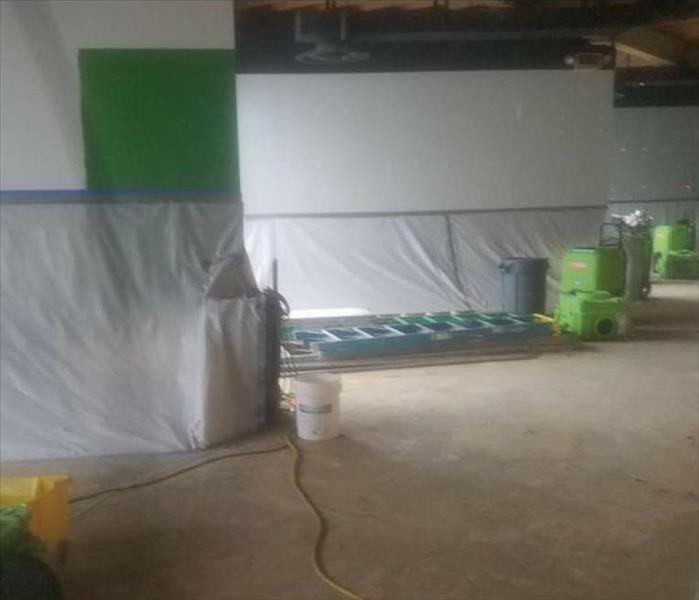 Our SERVPRO techs then set up low grain refrigerated dehumidifier to capture the remaining moisture and channel it to the exterior of the building, mitigating secondary water damage. Storm damage occurred at this Coconut Grove convenience store when gusting wind accompanying a thunderstorm blew out the front windows. As the photo shows, the wind gusts were strong enough to blow inventory off the shelves of the store. 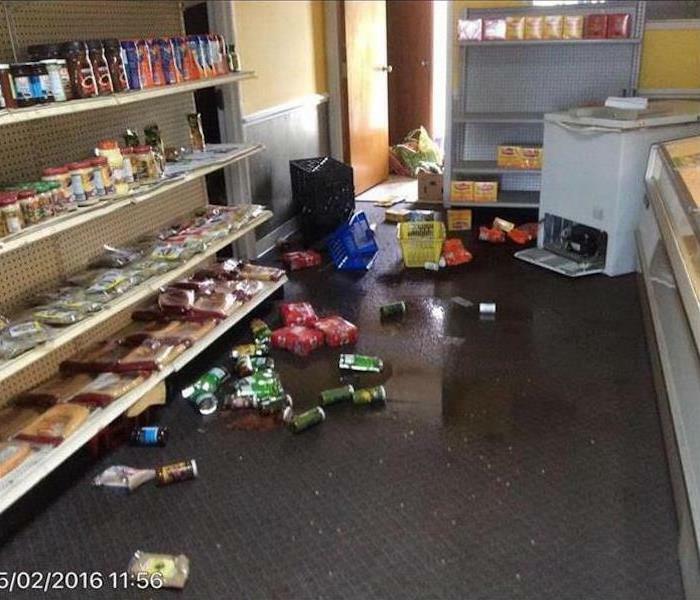 SERVPRO of South Miami was able to clean up the store and the water to get the shop owner back in business. 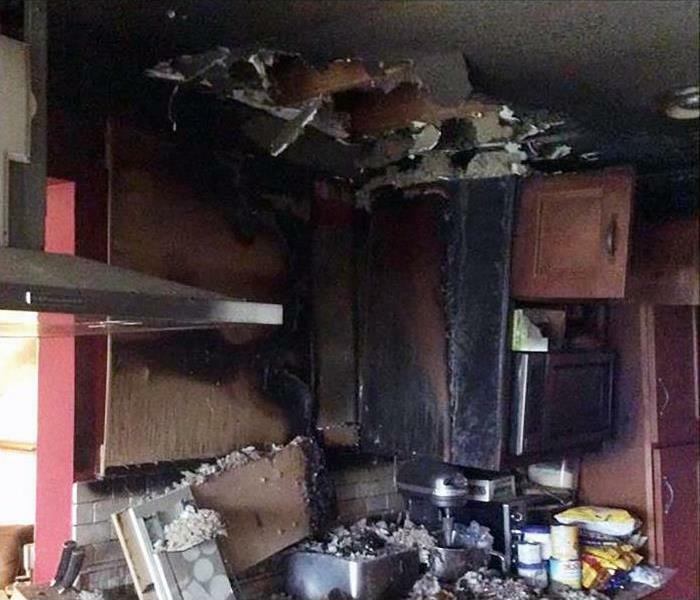 Fire damage at this Coral Gables home began in the kitchen when a pan on the stove was forgotten. Fortunately, for the homeowners they were able to extinguish the fire quickly leaving mostly soot and smoke damage. SERVPRO of South Miami was able to cle3n up the damage quickly and thoroughly. Mold damage at this Coconut Grove home began as simple water damage. The damage went from water to the mold infestation shown in less than three days. 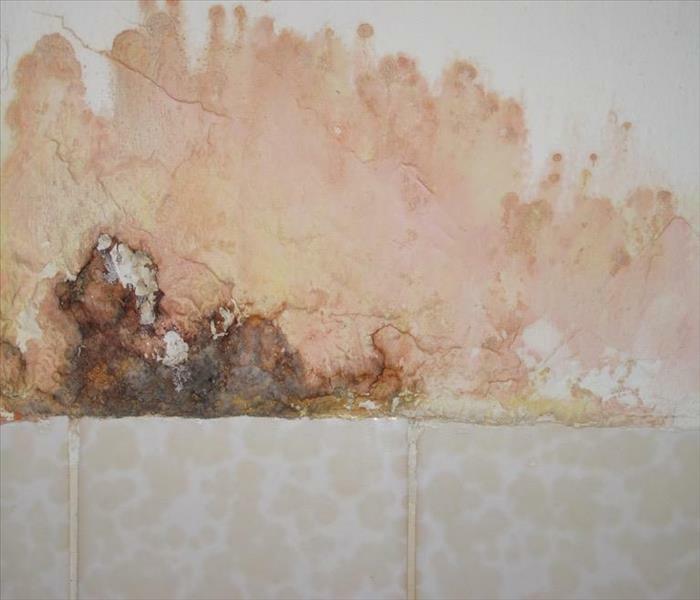 Mold damage can be harmful to the resident's health and should be analyzed by a professional and treated according to the type of mold it is. 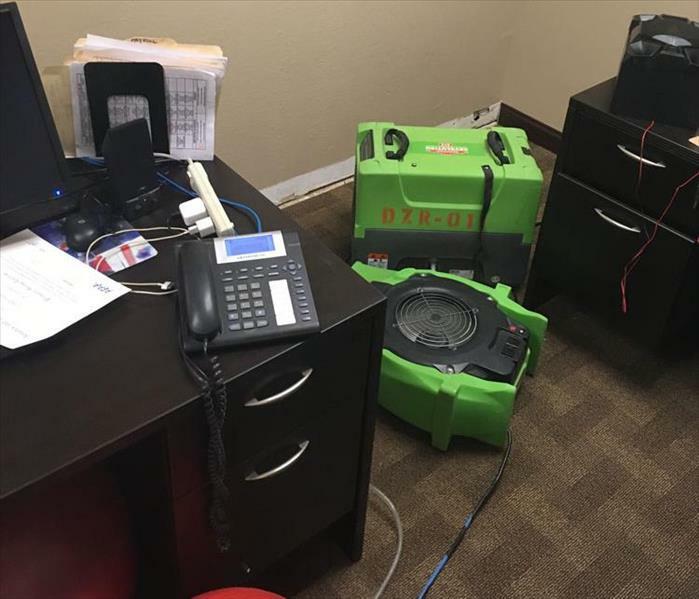 Commercial water damage at this South Miami office facility was severe and required a substantial number of commercial air movers and dehumidifiers. The faster we can remove water and dry surfaces, the less damage and expense are incurred. 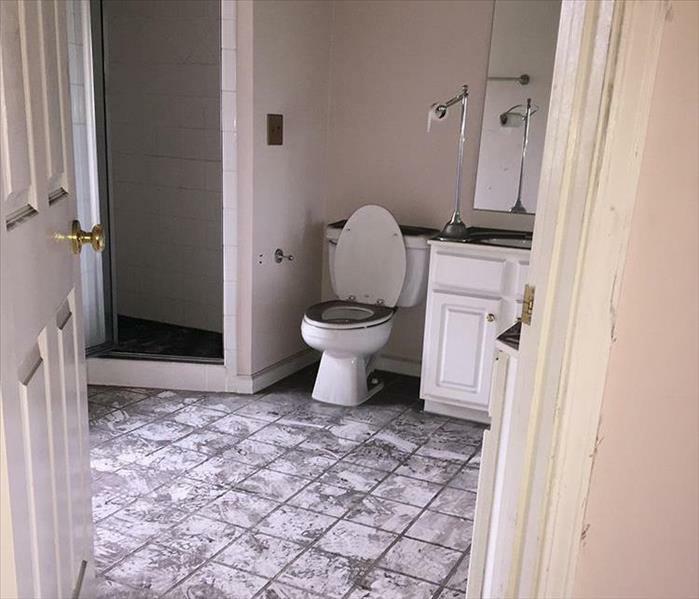 The house fire was very destructive, and the superheated air transported a large amount of dirty soot to this bathroom. The clean up was time-consuming and required many pieces of equipment and cleaning products. The tropical storm deposited a large volume of water inside this first-floor condo in Coconut Grove. The carpeting was saturated beyond salvaging. We also removed some crumbling drywall. The drying equipment will need several days to vanquish the remaining moisture from the condo before rehab can begin. 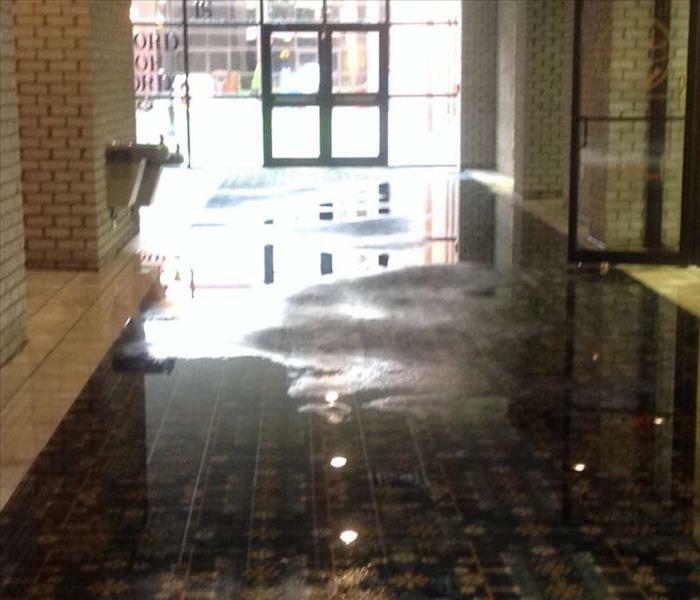 This lobby of an office building in Coconut Grove was flooded from a broken water line in the restroom. The water was not contaminated, so the primary target was water extraction and drying out the area to allow commercial offices to reopen. An electrical short in this wall caused a fire and smoke damaging event in this Coral Gables rental unit. Older buildings cannot always carry the juice needed to run electrical appliances safely. SERVPRO techs arrived here and wiped down the smoke residue and ran an hydroxyl machine to help eradicate odors. and there is often poor ventilation. Keep your exhaust fan functional, and if you don't have this device, SERVPRO suggests that you have one installed. As Hurricane Matthew approaches, the team at SERVPRO of South Miami is in their storm operation center and waiting to assist the community. Our team at SERVPRO is quick to respond and is ready to help you recover from any disaster. At SERVPRO of South Miami, our team of technicians provides 24-hour emergency service. If water damage from Hurricane Matthew has affected your property, call us today at (305) 269-8900. "Faster to Any Size Disaster." 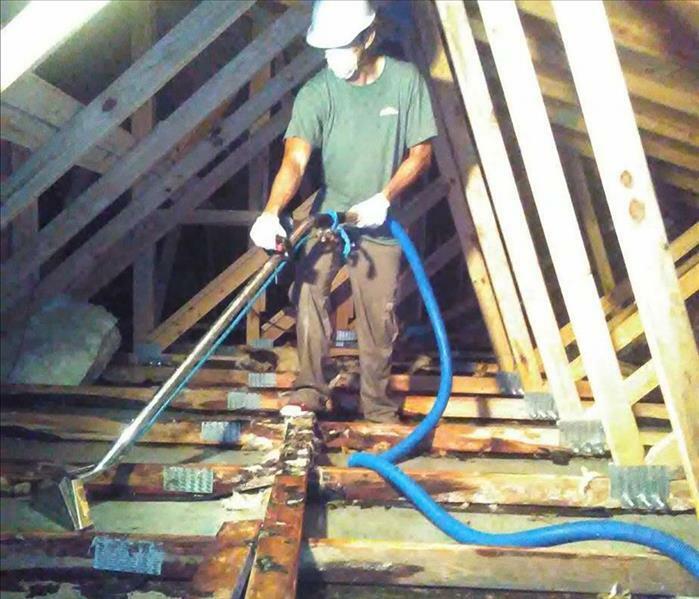 Mold remediation must be handled in a safe and efficient manner. The AMRT, Applied Microbial Remediation Technicians, contain the affected areas using poly sheeting while wearing HAZMAT clothing and gear. HEPA filtration systems and air scrubbers capture errant mold spores that may spread to future mold growth in different rooms of the home. Trust the SERVPRO of South Miami team to restore your home to its pre-mold safe condition by calling us at (305) 269-8900. The heavy rainstorm damaged the roof of this Key Largo Condo which resulted in a flood on the poured concrete ceiling. After our Water Damage Restoration Technicians (WRT) had removed the saturated fiberglass insulation, we sucked up the remaining water thus preventing damage to the floor below the attic. We dried out the area, salvaged the trusses by our fast effort, and sprayed an antifungal agent to inhibit mold proliferation. Just call SERVPRO of South Miami for fire, mold, or water emergency rapid response at (305) 269-8900. 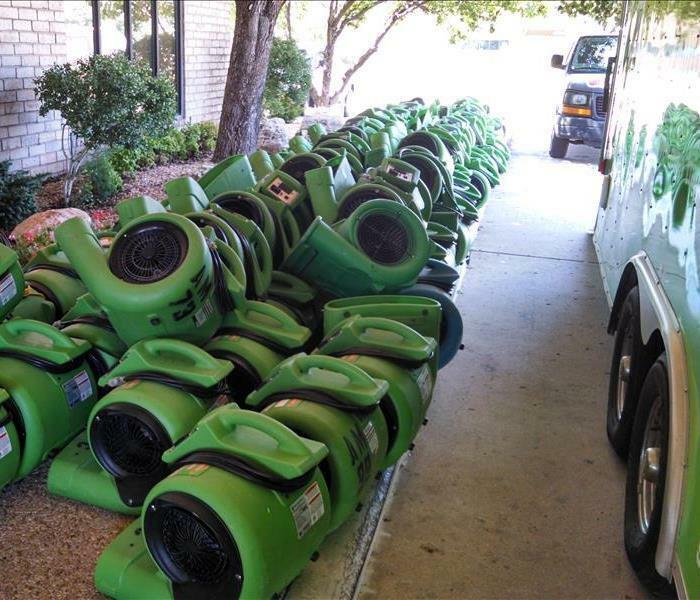 The aftermath of the April 18, 2016, floodwater damage to the Houston area resulted in the request for help from SERVPRO. We proudly provide four strategically placed National Recovery Response Teams to help in times of dire weather damaging events. We dispatched a crew from our SERVPRO of South Miami Franchise with expert technicians and high-tech industrial grade equipment, loaded on this trailer, and trekked to Houston. 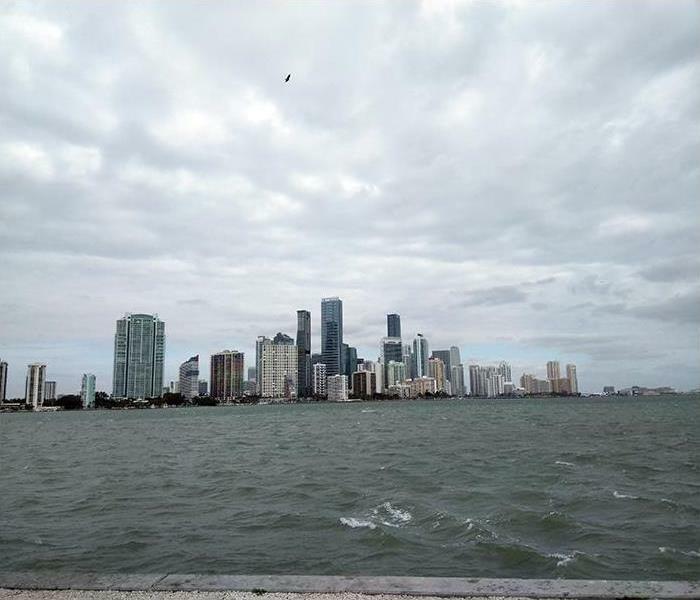 When a once-in-200-year flood occurs in Houston or Miami, you can rest easy when you place your trust in our company to help restore storm damaged order by calling (305) 269-8900. 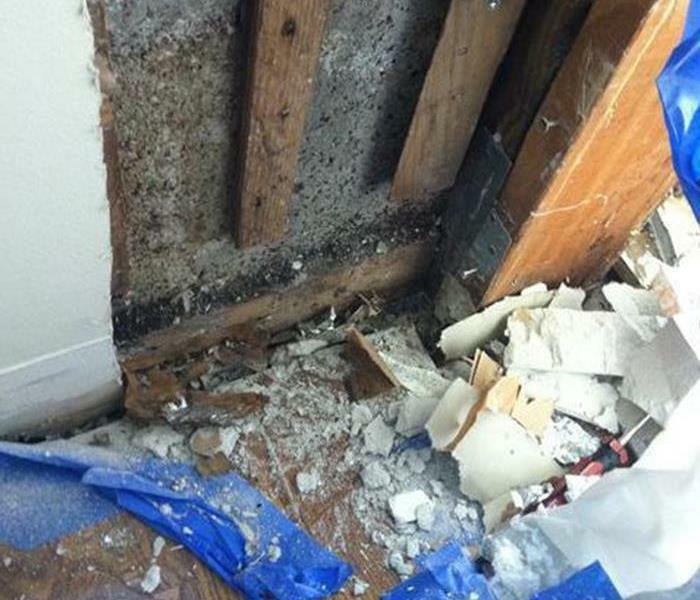 South Miami home encountered water damage that led to mold damage. SERVPRO of South Miami first carefully took down the water damaged and mold infested dry wall. 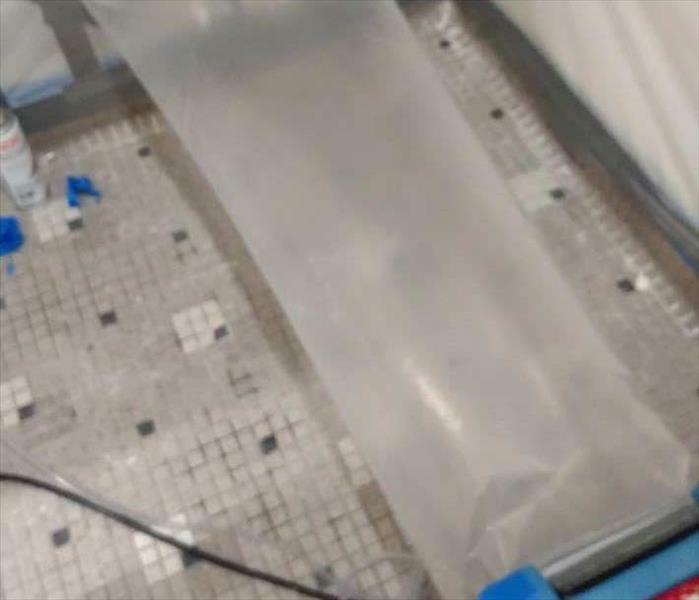 The surfaces were first dried, and then antifungal and antimicrobial treatments were applied to eliminate mold colonies and prevent new colonies from forming. SERVPRO of South Miami is proud to serve the communities of Coconut Grove, Coral Gables, South Miami, Kendall, Palmetto Bay, and surrounding areas. If you have an emergency call us at (305) 269-8900. We are available 24/7 for your emergency. 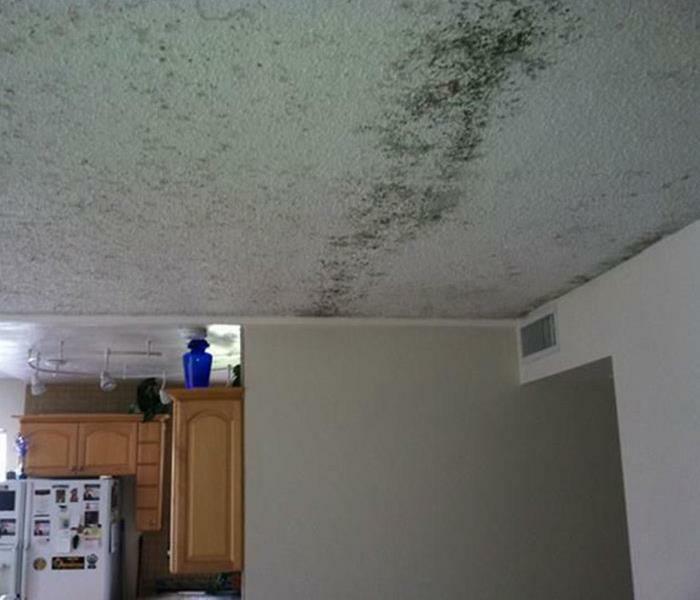 A small plumbing leak led to Coconut Grove mold damage in and on this ceiling. The ceiling had been saturated with water damage from the leak. The family residing in this home left for a long holiday weekend. You can see what they discovered when they returned. They needed someone to locate the source of the leak, fix the leak, remove the mold, treat the affected surfaces, and restore the ceiling. 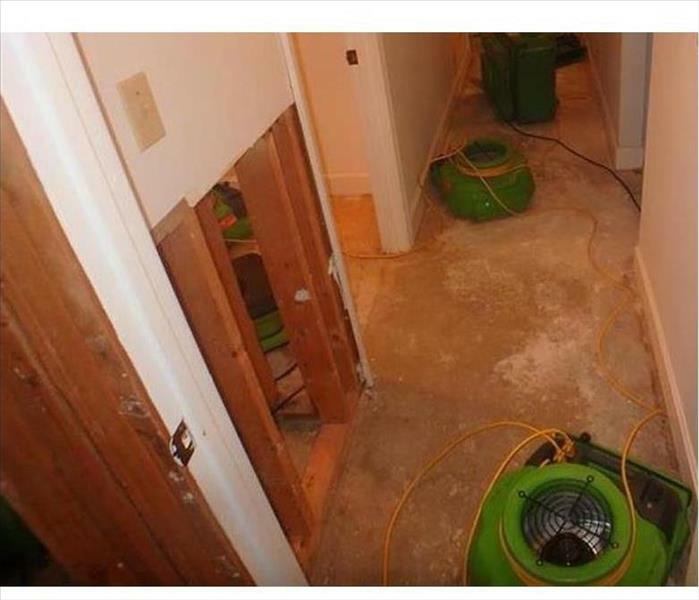 SERVPRO of South Miami was experienced in all these areas and they were chosen to restore the water damage and mold damage “Like it never even happened”. 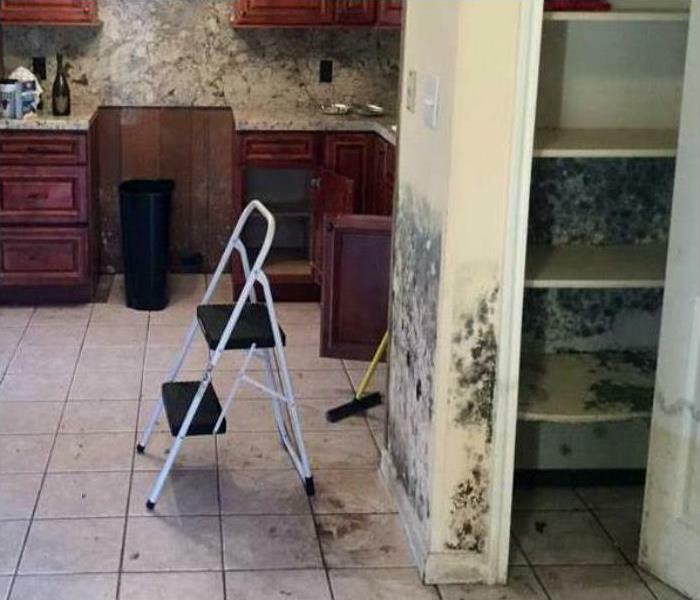 If you have a water damage or mold damage event in Coconut Grove, Coral Gables, South Miami, Kendall, Palmetto Bay, or surrounding areas SERVPRO of South Miami is there to help 24 hours a day 7 days a week. Call us at (305) 269-8900 when you need us. Flood damage in South Miami can leave residual moisture embedded in various types of building materials. You might not be able to see or feel this moisture; however SERVPRO of South Miami employs advanced moisture detection measuring equipment. Customers can be assured that their water damage has been thoroughly dried. 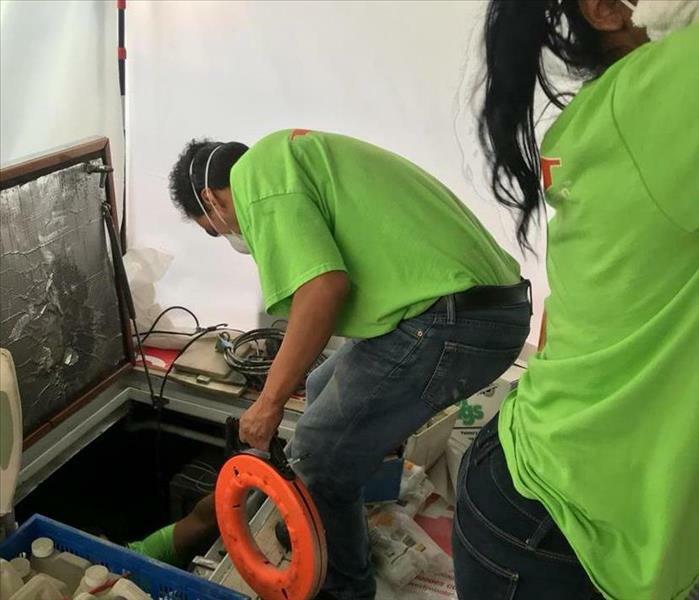 If you have a encountered flood damage along with accompanying water damage in Coconut Grove, Coral Gables, South Miami, Kendall, Palmetto Bay, or surrounding areas SERVPRO of South Miami is there to help 24 hours a day 7 days a week. Call us at (305) 269-8900 when you need us. Coral Gables Storm Damage Site encountered high winds along with significant water damage. This was a commercial building and the business requested we get them back in operation quickly without sacrificing the quality of service. The size of the facility required an abundant supply of advanced drying equipment to complete the project as the customer had requested. The drying process was monitored with sophisticated moisture measurement devices to insure that the facility had been thoroughly dried. The business owner was very happy with the time for project completion and the documentation for his piece of mind. If you have a large commercial property that is storm damaged in Coconut Grove, Coral Gables, South Miami, Kendall, Palmetto Bay, or surrounding areas SERVPRO of South Miami is there to help 24 hours a day 7 days a week. Call us at (305) 269-8900 when you need us. 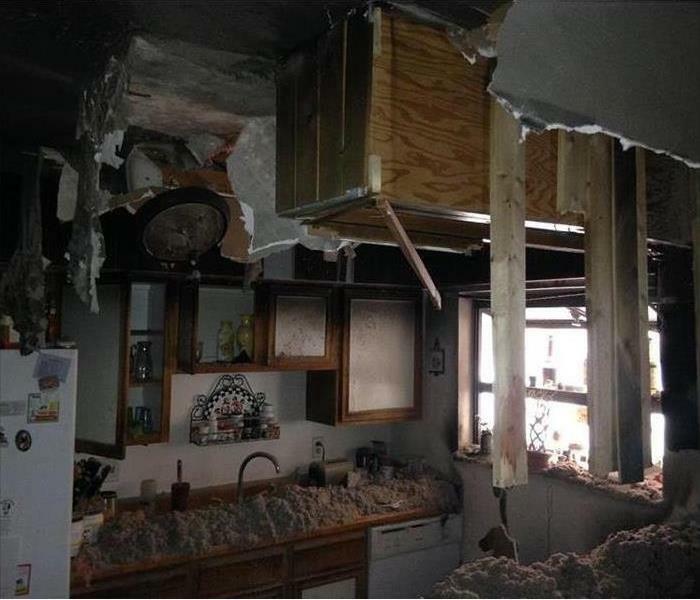 The fire damage in this Kendall home required SERVPRO of South Miami to bring their entire arsenal of containment and restoration expertise to this project. The photo shows the emergency board up services we provided. Our highly trained technicians then provided tear out, pack out, clean up, content cleaning, antifungal and antimicrobial treatments, deodorization, restoration, and move back. Finding all these services at one company led to completion in less time and simplified the process for the property owner. The step by step documentation of all phases of the project also streamlined the insurance claims process. 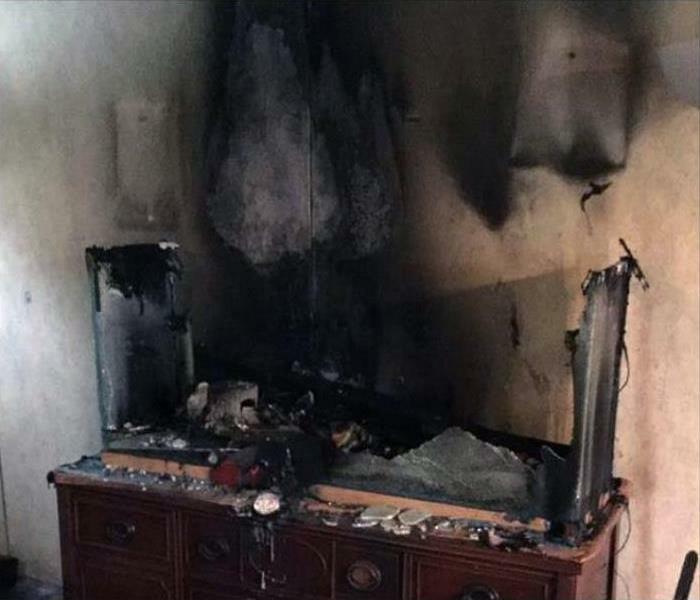 If you suffer fire damage in Coconut Grove, Coral Gables, South Miami, Kendall, Palmetto Bay, or surrounding areas call SERVPRO of South Miami at (305) 269-8900. WE provide emergency services 24/7.